In the force free training community, Time Outs are considered an acceptable form of punishment. We remove our attention for undesired behaviors (negative punishment). Experts like Jean Donaldson and Ian Dunbar suggest times out for puppy nipping. But not just for nipping. These behaviorists suggest that at first we allow puppies to bite. And we implement time outs for only the hardest bites. 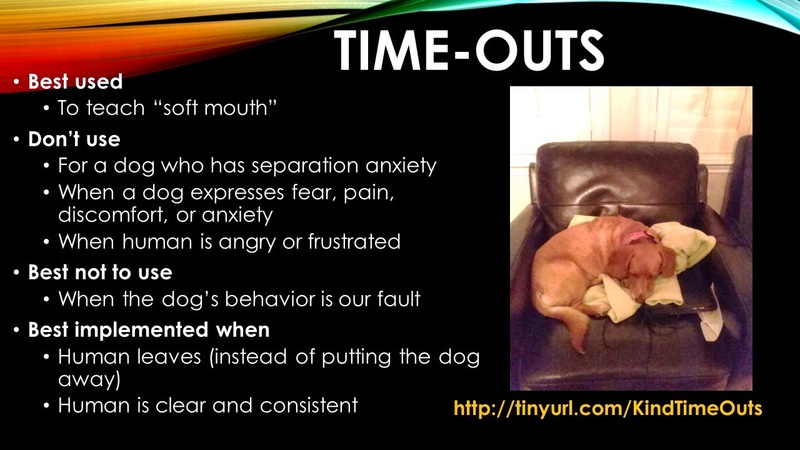 It's a way to teach "soft mouth"
But just like with any training process, time outs can be misused, overused or implemented incorrectly. Time outs have to be consistent. We can't allow hard bites when we are feeling playful and punish hard bites when we aren't in the mood. -The goal of time out is to remove our attention. If we have to handle the dog all the way to the time-out area, the pup is receiving plenty of attention. -If we are practicing time outs for hard bites, we can play with our puppies in a safe area (such as an enclosed play pen). When the pup bites too hard, we can calmly leave the play pen for a few seconds. -When we leave the pup, we should make sure that there is nothing within reach that will get the puppy into trouble. If we must remove the dog, be careful about grabbing collars.